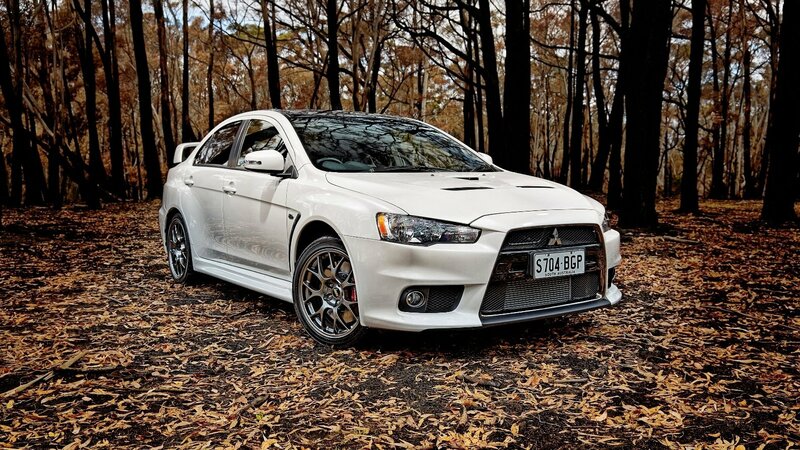 THE final Mitsubishi Lancer Evo has arrived down under, with only 150 iconic models on sale in Australia – representing tenth and final generation and delivering the best engine performance ever in the iconic performance model. Already known for its extraordinary performance, the Lancer Evolution Final Edition increases power to 226kW of power @6500 rpm and 414Nm of torque @3500 rpm, thanks in part to the application of sodium filled exhaust valves which increases cooling efficiency, allowing the engine to generate an even higher output and improving engine performance across both middle and high rev and torque ranges. Based on a design that powered Finnish racing legend Tommi Mäkinen to four straight titles in the grueling World Rally Championship (WRC), the turbo-charged and inter-cooled 2.0-litre DOHC four-cylinder engine delivers instantaneous power and torque. Consisting of a structurally reinforced cast-aluminium block, aluminium cylinder head and fitted with the latest edition of Mitsubishi Motors’ innovative MIVEC variable valve-timing system, this impressive engine’s architecture features a square design with both its bore and stroke measure an equal 86.0mm with a compression ratio of 9.0:1. Previously used in the highly successful Lancer Evolution VII, VIII and IX engines, the cylinder head valves are sodium-filled. The valves are hollowed out and then filled with specially formulated sodium. This achieves a weight reduction and improved heat dispersion compared to standard valves. The Lancer Evolution’s distinctive exhaust note is due to the systems free-flowing dual exhaust outlets. The stainless steel exhaust manifold and turbocharger are located at the rear of the transversely-mounted engine and close to the firewall which helps to improve weight distribution. 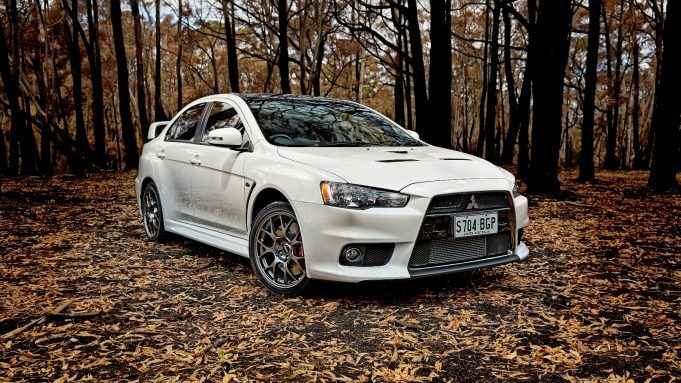 Lancer Evolution Final Edition comes standard with a short-throw, 5-speed manual transmission. Performance is further enhanced by the use of world leading motorsport suppliers including light weight two-piece Brembo brake rotors up front, accompanied by Bilstein shock absorbers and Eibach springs at all four corners. One of the most sophisticated and rally proven all-wheel drive systems ever developed for a production car, the Super All-Wheel Control (S-AWC) system, working with Lancer Evolution’s superbly engineered suspension, provides performance and tractability. The S-AWC system allows the driver to choose between three selectable traction mode settings – tarmac, gravel and snow providing maximum tractability and performance in all weather and road conditions. The S-AWC system is also complemented by the Active Yaw Control (AYC), Active Stability Control (ASC) and Sport Anti-lock Braking (ABS) with Electronic Brakeforce Distribution and Limited Slip Differential to deliver a remarkable level of traction and agility. Helping protect the vehicle’s occupants in the event of an accident are Mitsubishi Motors’ patented next-generation Reinforced Impact Safety Evolution (RISE) technology to help disperse energy from the cabin section as well as the fuel system and a supplemental restraint system (SRS) with occupant sensors and a total of seven airbags. The Lancer Evolution Final Edition also comes with a rear view camera. Outside, new 18-inch BBS satin platinum alloy wheels with gold centre wheel ornament, gloss black bonnet air outlets and front bumper centre, radiator grille with dark chrome surround and unique two tone colour range with black painted exterior roof enhance the Lancer Evolution’s famous good looks. A special ‘Final Edition’ badge also features on the boot lid. Premium interior appointments unique to the Final Edition model include leather steering wheel, park brake, shift knob with contrasting red stitching, black headlining, black pillars, leather look floor console with red stitching and ‘Final Edition’ carpet mats. Recaro partial leather bucket seats with contrast red stitching emphasise the Lancer Evolution’s performance credentials. The colour multi-information display also features a ‘Final Edition’ greeting on start up. The Lancer Evolution Final Edition has a unique two-tone colour range available in Starlight White, Tungsten Grey and Red with a contrasting black roof and Phantom Black with a contrasting gloss black roof. Each model will feature it’s own unique serial number plate – AU0001 to AU0150. The Lancer Evolution Final Edition MT has a recommended retail price of $53,700 and comes with a 100,000km/5 year warranty. JAPANESE luxury car maker Lexus will enter its halo model, the LC coupe, in the 46th running of the 24 Hours Nürburgring in May, its first appearance in the prestigious event.